After opening luxury doggie boutique BOW WOW in Covent Garden, actress Sheriden Smith decided to hit the shops with her pet Japanese Spitz, Trish. An incident occurred while she was checking out this season’s shoes in Kurt Geiger. Luckily, staff at KG saw the funny side, one employee tweeted that it was the highlight of her day. LA singer/song writer Judith Owen also shared that her dog had done the same at a Disney Concert Hall Christmas Show. It just goes to show, dogs love artificial turf. If your pets are making a mess of your lawn, fake grass is perfect for the back garden. You can clean up any ‘presents,’ effectively and hygienically with soap and water. Plus, it won’t stain or wear. Dogs cannot tell the difference and it’s a growing trend amongst owners. Jessica Alba famously installed an artificial turf doggie oasis in the grounds of her California home. We’ve worked on projects for Crufts and The Underdog Show. As well as installing lots of lawns for dog owners at private properties. Get your free quote on 01371 87 5901. Lawns need around 4 hours of light a day to stay healthy. North facing gardens are not so much of a problem in the summer because the sun is higher in the sky. The winter however can be a nightmare. The damp conditions cause algae, slime, and moss growth; you may even get the odd mushroom. If your house, neighbouring buildings, or tall trees cast a huge shadow over your lawn, it probably won’t get enough sunlight. Grass in a shaded garden is normally patchy and mossy and you’ll have the hassle of re-seeding every year. Lawns in sunny gardens can get scorched in the direct sunlight, turning grass from lush green to yellow/brown. Lawn watering is normally more costly, using more water means higher monthly bills. Swings, slides, and climbing frames leave unsightly marks on your lawn. Wear and patching is inevitable. Trampolines are the worst as the grass area underneath the mat is blocked out so gets zero sun. Falling apples, pears, plums or cherries can cause a lot of mess. Sticky, rotting fruit will attract pests into your garden and the remains are hard to clear up. You cannot clean natural grass. If you’ve got any of these lawn problems, fake grass could transform your garden, making it more attractive, more usable, and less hassle. You can be free of maintenance, save money on treatments, and start enjoying your outdoor space. The European Synthetic Turf Organisation’s (ESTO) 2012/13 report is useful reading for sports facilities considering a 3G pitch. You can read detailed discussion and analysis of the 4 key benefits of artificial turf. Clubs can use fake grass around 300 days a year, compared with 30-70 days for natural turf. Case study describes how a Swiss 1st division club are generating revenue by letting the stadium for private and business events. Maintenance savings can be as high as 50-60%. Pitch can be used by more organisations like schools and other teams. It becomes more embedded into the community. The guide includes comprehensive case studies for different organisations and sports. – The manager of semi-professional Sutton Coldfield Town FC says he’s found their new pitch much safer than natural grass. – Woodley Sports FC explain that they’ve benefited considerably from the opportunities generated by their new pitch. – Burnage RFC report that they’ve achieved 100% completion rate of fixtures, despite the North West weather. Full results of an ESTO survey of 110 professional Dutch football coaches about playing surfaces are also contained. 61.7% agreed that synthetic pitches enabled the development of better technical skills. When asked whether artificial turf improved acquisition of skill, 69.2% answered yes. Reasons given – it’s always flat, players must think faster because the ball moves quicker, they can concentrate on the ball without other factors. Read it here – It’s quite a big PDF document so will take about 30 seconds to download. 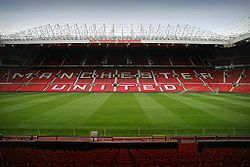 Last month Manchester United announced that Old Trafford is to have an artificial grass pitch. They’ll take up the natural turf and install an £800,000, state of the art 3G football pitch over the summer. Last replaced 10 years ago, the pitch is serious need of an overhaul. According to Sir Alex Ferguson, the surface collapsed last winter during a period of heavy rain. Bosses were worried the bumpy surface would lead to injuries. It took turf managers months to restore it. A hybrid mix of 20 million fake fibres and natural grass will make the pitch studier, more reliable and improve play. First the pitch is re-seeded with grass selected based on soil conditions. The artificial turf installed by a computer powered machine that needle-injects the fibres into the ground. This becomes entwined with the roots of the natural grass anchoring the field and creating a firm, reliable surface. The method is also known as ‘reinforced grass’ because of its strengthening and supportive properties. Man Utd. were impressed by the successes at Wembley Stadium. New Wembley had a catalogue of pitch problems until they installed the new high-tech surface. One of Moyes’ first jobs as manager was to give the go-ahead for the new playing surface. The club have made sections of the old pitch available to fans. Supporters were given the opportunity to buy their very own piece of Old Trafford after the Legends game – Man Utd. vs. Real Madrid.